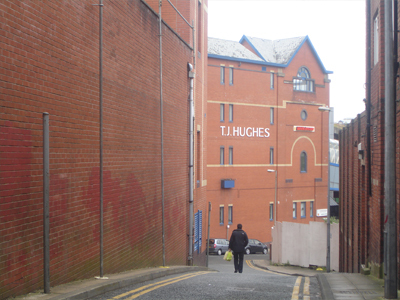 Rochdale is an archetypal Lancashire industrial town – or is it? Set in the Pennines and built along the steep Roch valley, from the streets of Rochdale the moors are always in your view. But where are the mill chimneys? Nearly all are gone, as are most of the mills. However church spires still provide vertical emphasis, now joined by many minarets. 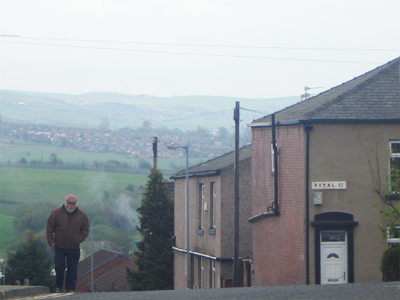 Dramatic scenery is the backdrop to Rochdale. This is stunning countryside of mountains, moors and picturesque stone built small towns and villages. The Pennine Way runs just east of the town along the Yorkshire boundary. Officially Rochdale is in Greater Manchester. Whilst the town has always been in the orbit of Cottonopolis, only 10 miles away, it is really quite a separate, independent minded place – the home of the inimitable Mrs Duffy. Rochdale was one of the earliest industrial towns, beginning with woollens and later cotton spinning, bleaching and dyeing. However it peaked early. Its population was already 80,000 in 1851 and yet is only 95,000 today, although the population of the Borough including surrounding townships is about 200,000. Whereas Manchester reinvented itself in the late C19th as a commercial centre and now the fun capital of the north, Rochdale experienced a slow relative decline from its zenith over 100 years ago. However the town has adapted to survive and it is perhaps not a coincidence that Gracie Fields, who defined the spirit of resilience in the last Great Depression with ‘Sing as we go’ and ‘Wish me luck as you wave me good-bye’, came from Rochdale. More recently Cargo Studios has been described as one of the eminent recording studio of the post-punk era. Joy Divison's "Atmosphere" should also read "Made in Rochdale". 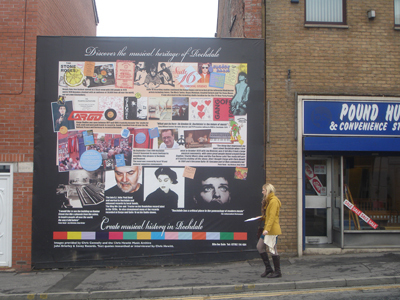 But while the Tony Wilson style music myth making is welcome here, the impresario's late flirtation with Urban Splash is thankfully not. 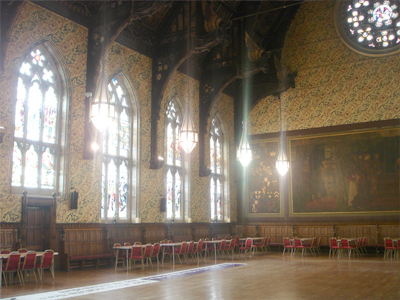 Two things particularly mark Rochdale’s historical importance – its absolutely stupendous Town Hall, more than the equal of Manchester, and the Rochdale Pioneers. This was the first co-operative, established in 1844 and which started the hugely significant Co-operative movement that is today just about the most positive, ethical and sustainable force in the high street and in finance. The Co-op headquarters are in Manchester around the wonderful CIS tower (1962) which exemplifies the optimism of that era. You reach Rochdale from the adjacent Victoria Station, recently voted the worst in Britain although it still retains traces of its former glory. Under-investment in Manchester’s fragmented rail network is a national scandal and serves to isolate Rochdale. The train from Victoria is fairly clapped out but if you are lucky only takes about 15 minutes. Rochdale station is out of the town centre which is down in the valley. Metrolink trams are being extended via Oldham to Rochdale and will connect the Station with the town centre and bus station – a good bit of planning if long delayed. However at present the area is a construction site. 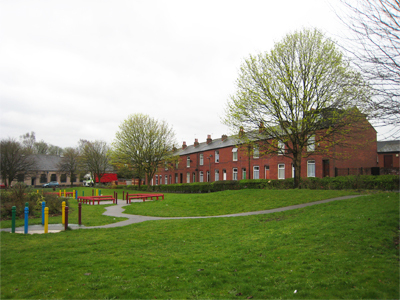 Before exploring the centre it is worth looking at some of the terraced housing close to the station, as housing renewal is one of the big themes of Rochdale. 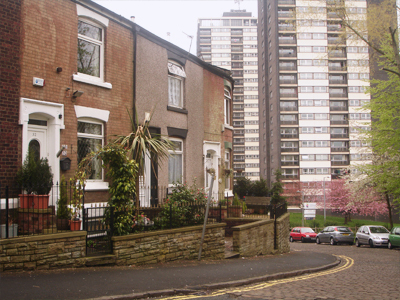 After a decade of massive housing clearance and rebuilding the government in 1966 published the influential Deeplish report, which explored the possibilities for improvement of older housing in an area just south of Rochdale station. 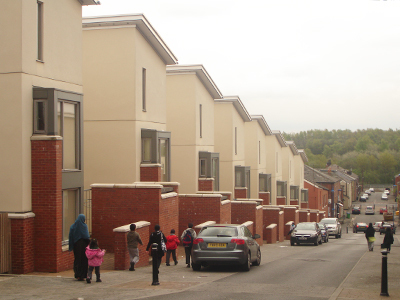 This effectively changed national policy with an end to large scale clearance and the invention of ‘General Improvement Areas’, which envisaged large scale public intervention to upgrade traditional terraced streets. Deeplish today looks like a very pleasant mixed inner city suburb. However the area immediately west of the Station around Tweedale St illustrates some of the failures as well as successes of area improvement over the last 40 years. You will quickly notice that the terraces and streets are much more varied than you might have expected with subtle differences in the quality of building reflecting social and economic distinctions. As Ena Sharples says in the first ever Coronation St episode recently re-screened: ‘Esmeralda St – that’s very bay window’. The best terraces, usually with bay windows and little front gardens look very pleasant indeed. 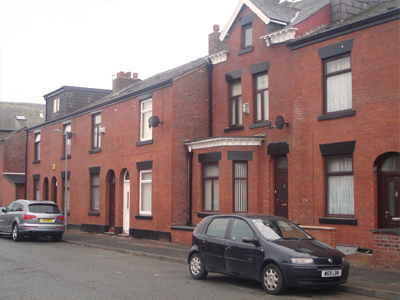 Other terraces have been given a make over, sometimes with render and others, strangely, by re-facing the original Accrington with poorer but softer toned bricks which have not weathered well. Original windows and doors, usually finely detailed, are mostly replaced by crude PVC. However it is remarkable that the attractive slate roofs largely survive. In most towns this important unifying element is usually destroyed by a jumble of different replacement concrete tiles. Part of the GIA mantra was selective demolition to allow for new houses and to create play space and parking areas. You can see this clearly south of Tweedale St. Some terraces were even knocked down to provide longer gardens for retained terraces. There are pockets of new housing within the context of the terraced streets from the 70s onwards, some of it fairly successful. There are also undeveloped gap sites and a pervasive air of neglect, with rubbish everywhere (this sadly is a feature of Rochdale) and social problems evident on the streets. Comprehensive area improvements gave way to individual house improvements in the Thatcher era. However there is evident continuity between GIAs and the Pathfinder Housing Market Renewal strategy introduced by Prescott. 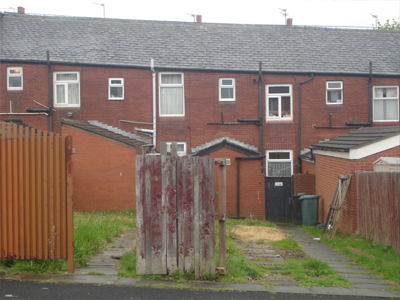 In many areas neighbourhoods have been wrecked and decent houses destroyed by Pathfinders but Rochdale may be the exception. Here it seems like a continuation of a reasonably successful long term programme. For example at Trafalgar St in Wardleworth, just east of the centre OMI Architects have reinvented the terrace on a steep site as striking groups of linked houses with 2 storey bays and living areas grouped around private external spaces. With Sure Start, new health facilities, training and youth projects, some aimed at the large Asian community there is real evidence of the last government belatedly beginning to make a difference in very deprived neighbourhoods. Rochdale has done excellent work with local communities in developing what are effectively Neighbourhood Plans and new housing schemes such as Dale Mill in Hamer. 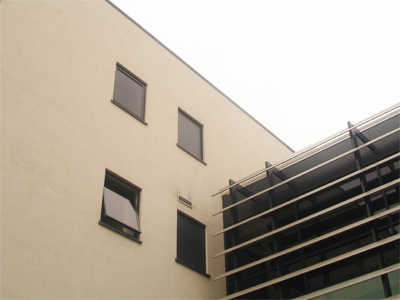 This has been designed by Proctor and Matthews and was highly praised by CABE. It will be scandalous if the community is now left in the lurch by Pickles and Shapps. Around the incipient square for the new Metrolink tram stop in front of Rochdale station there are some interesting buildings. 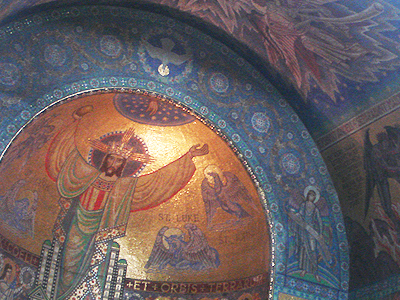 St John Baptist Catholic church is a huge basilica of 1924 with a concrete dome and windows below evoking Aya Sofya – very impressive but Pevsner says reactionary for its date. Opposite is the Fire Station of 1933 with a fantastic campanile looking positively Hanseatic. Now empty it could make a really interesting conversion including shops and cafes to animate this arrival space. Also facing the square is Nye Bevan House, a new Health Centre by Nightingale Associates bringing together an impressive range of health care. Attractive, light and crisp if not especially distinctive architecture it is an excellent advertisement for the NHS and in the tradition of the Finsbury Health Centre. No doubt Lansley will soon rename it Crapita House. Following the tram route you reach Drake St which curves down the hill into the town centre. This used to be one of the main shopping streets but is now almost like Detroit. A few fine buildings survive amongst the vacant shops like Trafalgar Buildings with its fabulous art nouveau metalwork crown and the proud stone Champness Hall of 1925. Kenyon Street, leading off Drake Street, was home to Cargo Studios where Peter Hook unveiled a blue plague in 2009. When will English Heritage move in? Hopefully the new tram will help revive this area but by itself this will not be enough. Much public money has been squandered on big ego and big price tag ‘regeneration’ projects in the big cities while places like Drake St rot – an extreme example of the impact of supermarkets and changing retail patterns. The nearby Asda off Dane St is claimed locally to be the ugliest in Britain, but actually it is just typical of the genre. 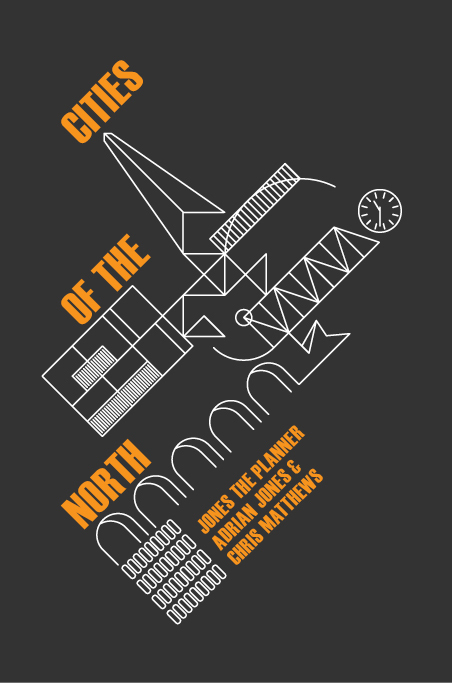 The Metrolink terminus will be at Smith St at the bottom of Drake St. To the north are the unlovely 1960s municipal offices known as the Black Box and the bus station with multi storey car park above – all a bit grim. You have to admire Rochdale Borough’s chutzpah at this time of public sector cuts in pushing ahead with an ambitious redevelopment scheme which will provide new council offices and a library. This will be opposite on the south side of the Metrolink terminus next to the River Roch. Designed by Faulkner Browns with (they say) excellent environmental credentials, its sinuous form follows the river. Building work has just started. There will also be a new bus station. The plan is to then replace the 60s structures with an extension to the Wheatsheaf shopping centre behind. This is an excellent idea in principle which, together with the new civic offices and library, could create a lively new square around the Metrolink terminus, but all depends on the quality of the design and its street frontage activity. 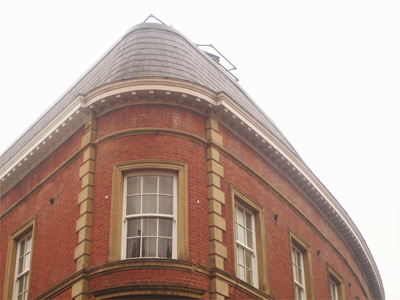 The present Wheatsheaf Centre, although gross and insensitive to its surroundings fortunately has little visual impact on Yorkshire St, the main shopping street of the town with its jumble of friendly red brick Victorian buildings and alleys. However the Exchange Centre further down the street has a much longer frontage and is a visual disaster. Although some thought has gone into its mass and geometry, the buildings are over-scaled and hideously assertive with an oppressive mass of banal pink facing blocks, witless fenestration and a horrible canopy. Needless to say the shopping centre is incapable of providing shops which relate to the fall of the street. 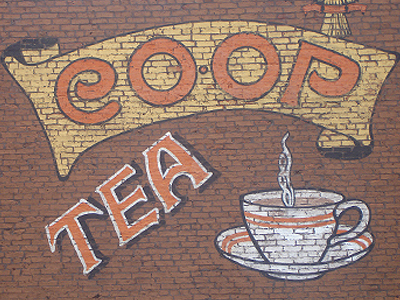 The Exchange Centre is an impenetrable barrier between the centre of the town and the fantastically named Toad Lane where you will find the original Pioneers shop of the first ever Co-op. This is currently being renovated as a museum. Next to it is the marvellous Baum pub retaining an advertisement for Irlam’s tripe on its façade. Opposite is St Mary, originally of 1740 and remodelled by Ninian Comper in 1911 completing an attractive little enclave between the ring road and the back of the Exchange Centre, with its long and tedious car park elevation dressed in yellow brick with red edgings and absolutely ridiculous pediments. It is best to walk around the shopping centre as you will get lost inside. Treating the street layout with charm and respect. Packer St leads to the parish church of St Chad with a square tower set on the hill behind the Town Hall. There is a wonderfully dramatic flight of steps up through the graveyard, all very Bronte-esque. The medieval origins of the church are disguised within the Victorian rebuilding. Packer St has good buildings including the millstone grit Flying Horse Hotel and a sophisticated palazzo which looks like a London club. My favourite however is the 60s Koko Lounge with 3D guitars and saxophones on the fascia. This could be a really pleasant square with the Town Hall opposite and the vista closed by the church on the hill but is actually one big car park. In front of the Town Hall is Memorial Gardens, a first rate space from which you can appreciate one of the other great sights of Rochdale – the Seven Sisters. 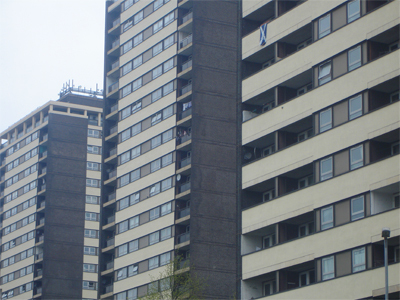 These are 16 to 20 storey blocks of flats to the north on College Bank above the river. They are strikingly sited and are a counterpoint to the grand civic buildings on the Esplanade. As Pevsner says they are ‘well and crisply designed’. They speak of confidence and ambition. They make Rochdale feel like a big city. To either side of the gardens are interesting modern buildings including surprisingly the Brutalist tax office which almost seems to float above its podium. 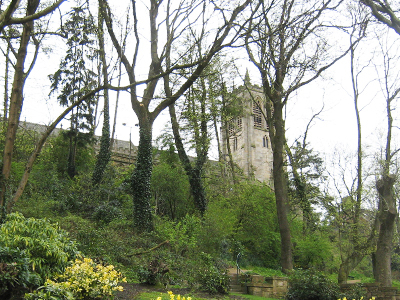 The Esplanade, with public buildings set in gardens and the parish church behind also in a park, is a fine feature of Rochdale and makes it quite distinct from other towns. Dominated by the Town Hall it includes at the east end the neo-classical Post Office and at the west end the Elizabethan style Library of 1883 and the Art Gallery and Museum of 1903, with elaborate panels of figures connected to the arts. It is a pity that the dominant parking intrudes into the relationship between gardens and buildings. The absolute tour de force of Rochdale is the Town Hall. The only competitors can be Manchester, Liverpool and Leeds, all much bigger cities, and nearby Bolton. 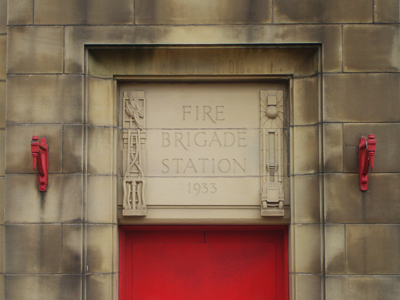 Designed by Crossland, a Yorkshireman, it was completed in 1871 and opened by John Bright, the Radical local M.P. It is therefore contemporary with Manchester and the tower was rebuilt by Waterhouse in 1883. The style is Gothic but as Pevsner says ‘such as no Gothic town hall could ever have been’. The exterior is a riot of turrets, stepped gables, fleches, steep pitches and arcades. The interior is if anything even more exotic. 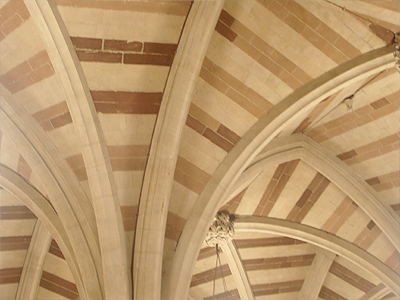 You enter through a vaulted hall which leads to the grand flight of the staircase hall. On the upper floor is the Great Hall with a hammer-beam roof, which really lives up to its name. The lavishness of decoration throughout recalls Burges at his wildest. A truly amazing experience. The new linked houses: terrace-detached? So here is a town with a great past. What of the future? 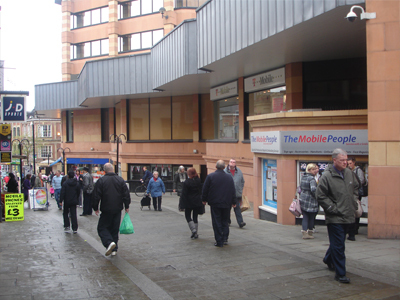 Medium sized towns like Rochdale are particularly at risk in the current recession. Overshadowed by glitzy Manchester it struggles for investment. The spending cuts also target the industrial north and will undermine the evident improvements to social, educational and health facilities over the last decade. The abrupt ending of the Pathfinder programme is a big problem. But Rochdale does have a lot of assets. Its position next to the huge green lung of the Pennines will be increasingly attractive in a more sustainable future. The recent re-opening of the Rochdale Canal (rather grander than the name implies and linking the trendy lofts of New Islington to Yorkshire) helps to open up access to this countryside. 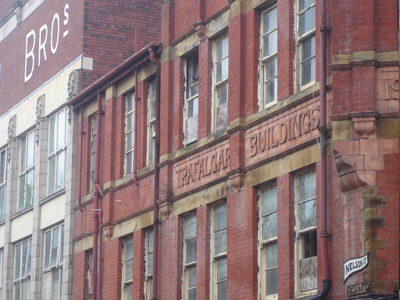 Rochdale also needs to capitalise on and to protect its historic built environment which is very fine. It is disappointing that the magnificent St Edmund church in Falinge is on English Heritage’s list of the 10 most important buildings at risk. 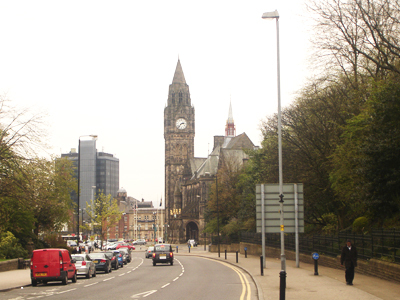 The town actually has good motorway links with quick access to dynamic Manchester and Leeds. Will Alsop’s M62 City may have been barking (have you seen the traffic?) 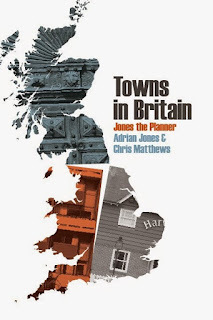 but the concept of towns specialising in a bigger economic framework is only a re-interpretation of the Cottonopolis system, or indeed China today. The impact of the M62 is already very evident in the location of new offices (outside the town centre) and the development of massive distribution parks. These confidently designed behemoths actually look good in the grand scale of the Pennine topography, so different from the ‘don’t look at me’ shedscape of so much of the M1. Rochdale needs confidence and leadership. The two things go together. 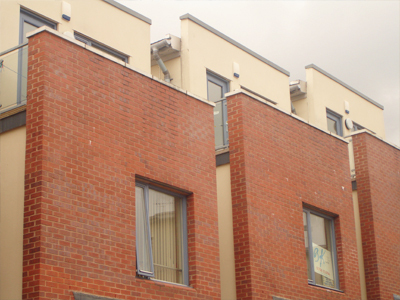 The town has shown confidence historically and in the recent past, for example in building the Severn Sisters and more recently schemes like Nye Bevan House. The Borough certainly seems to be providing leadership in its ambitious approaches to community renewal and in town centre regeneration. The new civic complex, far from being a waste of public money, actually gives the opportunity for qualitative improvements to public services and the reinvention of the town centre as an attractive social place. Perhaps Rochdale needs to be even bolder in its approach using good urban design to bring together the best elements of the town to make a really exceptional place. Above all the government must support Rochdale to continue its largely successful strategy for neighbourhood renewal. This is real regeneration – not big and shiny projects but long term, concerted and people focused. But there is one thing Rochdale could do – should do as soon as possible – tackle the pervasive problem of litter and rubbish which is everywhere in the terraced streets and degrades a town which otherwise has a lot to be proud of. Thanks for help in researching this blog to Rochdale (but Man United supporting) lad Grant Butterworth and Mrs Jones-the-planner whose Marland ancestors originated in Rochdale. N.B. The Baum was perhaps the best pub on our journeys so far. Great site. agree with most of it. You have hit the nail on the head with your description of Yorkshire street and the 'shopping centre'. They completely destroyed the heart of Yorkshire street when they demolished the outdoor markets and built the grotesque shopping centre. If you want a mobile phone and cheap clothes shop then you would be OK.
And they think the tram is going to bring people in. I don't think so. It will be the reverse. 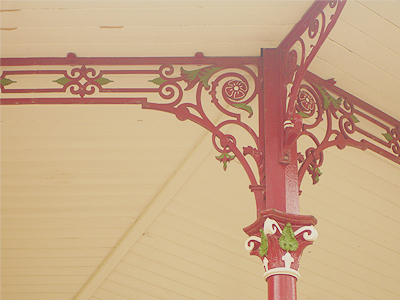 Rochdale has some beautiful buildings. Can't the planners focus on these.